How to Clean a Washing Machine the Cheap & Easy Way! We count on our appliances to clean our things. Dishwashers clean our dishes, washing machines clean our clothes…but do we ever consider that maybe those machines need a little TLC too? You ready for this; you only need two things: bleach and vinegar. Don’t worry – we’re not going to ask you to mix them (because that could be bad!). You may also want to grab a magic eraser to wipe down the inside. Set your washing machine on the hottest wash setting and begin filling the empty basin with hot water. As it begins to fill, add 1 quart of bleach to the water. Close the lid to let the cycle begin for a few minutes and mix the bleach, then open the washing machine’s lid and let the hot bleach water sit and soak for about an hour. After an hour, close the lid and let the cycle run its course and drain. For Step 3, you do exactly what you did in Step 2, but this time you use vinegar instead. This step will further disinfect the inside of the basin and break down residue. Once all the water drains, inspect the interior of the basin and see if there is any remaining buildup on the agitator in the center. If so, grab your magic eraser and wipe it down. And just like that, your top loading washing machine is now sparkling clean and more effective! 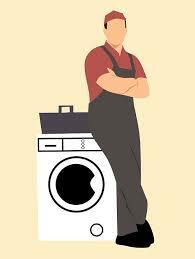 We hope this cheap and easy washing machine cleaning tutorial helps extend the life of your appliance, and should your washing machine ever have any issues, be sure to call Appliance Rescue Service in Dallas, Texas – the best appliance repairman in Dallas!